The U.S. stock market is being held hostage by a painful and lengthy recession in corporate profits. Wall Street is bracing for the earnings recession to hit the one-year mark this earnings season, which kicks off next week when Alcoa (AA) and JPMorgan Chase (JPM) reveal results. The timing of the profit downturn is somewhat unusual because it's taken place in the face of an American economy that continues to grow, albeit slowly. But the one-two punch of cheap oil and strong U.S. dollar have been powerful enough forces to drown out that steady growth. 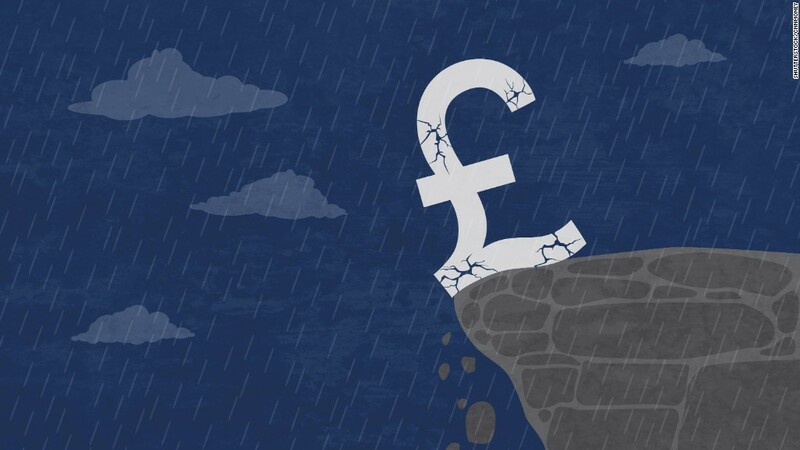 "The depth and breadth of the current earnings slump is quite rare outside of an economic recession," Paul Eitelman, investment strategist at Russell Investments, wrote in a recent report. The good news is that profits could resume growing later this year. 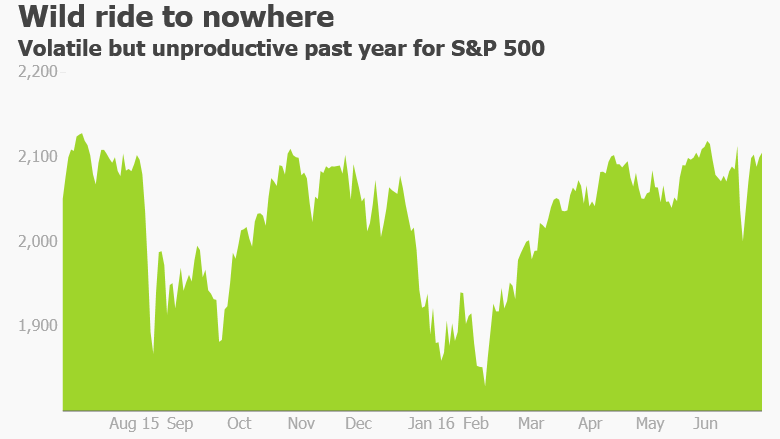 The market has stalled out ever since the profit recession began in the third quarter of last year. When earnings shrink, stocks suddenly look more expensive. Even Federal Reserve chief Janet Yellen recently warned that the market is trading at historically high valuations. Just look at how the S&P 500 is trading at 17.1 times forward earnings estimates -- near the loftiest levels of the past seven years, according to S&P Global Market Intelligence. Related: U.S. stocks are trapped. When will they break free? The upcoming earnings season may only worsen those valuation concerns. Second-quarter profits from S&P 500 companies are expected to decline by 5%, the fourth-straight quarterly drop, according to S&P. The most pain will be felt in the energy sector, which is expected to suffer an incredible 81% plunge in profits due to lower oil prices. Even diversified oil giants Chevron (CVX) and ExxonMobil (XOM) are on track to suffer big profit slumps. More bottom-line trouble is brewing in the financial sector as banks grapple with extremely low interest rates that depress earnings. Citigroup (C), JPMorgan and Wells Fargo (WFC) are all expected to disclose profit declines when they hit the earnings stage next week. The U.S. dollar remains another sore spot, especially for multinationals like Pizza Hut owner Yum! Brands (YUM), which reports results on July 13. A strong dollar makes U.S. goods sold abroad more expensive and hurts revenue when it's translated back to dollars. Thankfully, American consumers continue to open their wallets, due in part to lower gasoline prices. Consumer discretionary stocks are poised to log a healthy profit gain of nearly 10% this earnings season. Big expected winners include Amazon (AMZN), which analysts believe will reveal an incredible six-fold increase second-quarter profits. "It's a very good sign for our economy. The consumer is hanging in there," said Lindsey Bell, a senior analyst at S&P Global Market Intelligence. America's profit recession could finally end in the second half of this year, thanks to higher oil prices and a tamer U.S. dollar. S&P 500 profits are expected to grow 2% in the third quarter, 8% in the fourth and then by double-digits in 2017, according to S&P. But Wall Street will be paying close attention to make sure CEOs are still expecting a rebound later this year, especially given the Brexit turmoil in Europe. The other crucial thing to look for is confidence that the long-awaited revenue rebound is materializing after what is expected to be a sixth-straight quarterly decline. In the past, Corporate America has masked anemic sales by cutting costs and buying back stock, but there isn't much room for those moves at this point in the economic cycle. "We've run out of financial tricks and now we're waiting for real economic growth to show up," said Brad McMillan, chief investment officer for Commonwealth Financial Network.